﻿Groundhog Day: Calendar, History, Tweets, Facts, Quotes & Activities. Groundhog Day marks the midway point between the winter solstice and the vernal equinox. It is a derivative from the early Christian holiday of Candlemas Day. The holiday is commemorated when a famous groundhog, Punxsutawney Phil, emerges from his burrow and looks for his shadow. The tradition goes that this day, is used to help determine how many weeks of winter might be left. It is observed every year on February 2nd and was established in 1887. In 2018, Pennsylvania's groundhog Punxsutawney Phil did indeed see his shadow, meaning, as the legend goes, he predicted 6 more weeks of Winter. The Groundhog emerges from his hole after a long winter sleep to look for his shadow. If it is sunny and he sees his shadow, there will be six more weeks of winter and he returns to his hole. If it is cloudy and he does not see his shadow, he will stay above ground as spring is on its way. 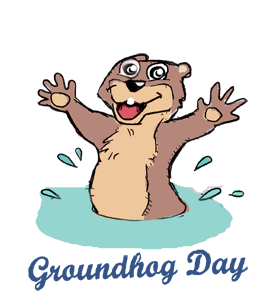 The first Groundhog Day was celebrated on February 2, 1887, in Punxsutawney, Pennsylvania. A local newspaper editor, Clymer Freas, convinced his friends-known as the Punxsutawney Groundhog Club, for their love of hunting groundhogs - to visit Gobbler's Knob. After observing a groundhog emerge from his hole, they determined that seeing his shadow was a bad omen and meant there were at least six more weeks of winter. Groundhogs, otherwise known as woodchucks, are rodents. They hibernate throughout the winter. Turn your face to the sun and the shadows fall behind you. - Maori Proverb. Visit Punxsutawney, Pennsylvania and see Phil the groundhog in person. Watch the movie Groundhog Day . Host a Groundhog Day party. Record the emergence of Phil from his hole and play it back at the party. Several days before the party, have all of the attendees send in their prediction regarding whether Phil will see his shadow. Have small prizes for the winners. Watch Phil emerge from his hole live via television. Make a bet with yourself: If he sees his shadow - complete one chore, if he doesn't see his shadow - treat yourself to something fun.